What does it mean to be a shepherd? Different things to different people, no doubt. It’s context dependent, for one: Where are you? What is the land like? The climate? Do you (or can you) belong here? Do (or can) your flock? A shepherd will need to know, and will constantly be learning about, the land on which they’re working, as well as the land around them and its inhabitants. It also depends upon your flock: What sort of health is it in? 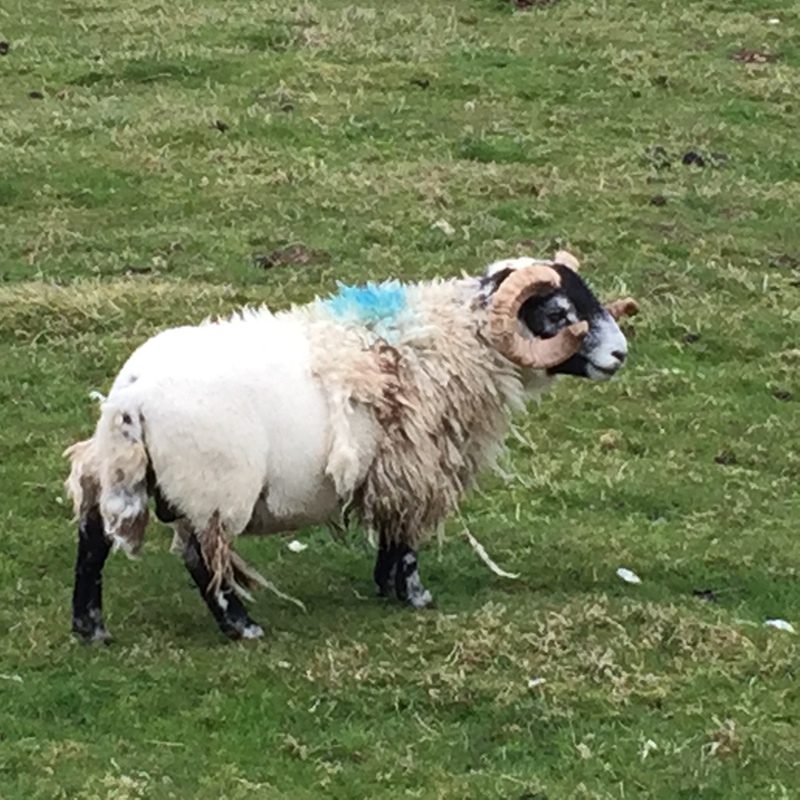 What’s the inheritance from its previous shepherd(s)… has it been bred and developed well? What are the strengths and weaknesses in it? Is it hefted? These will determine what is possible, which strategies for growth are likely to be fruitful and help individuals and the group as a whole to flourish. Shepherding is not learnt in a day. It takes a combination of skills that must be acquired and honed. It requires wisdom that can only be accumulated over a lifetime and deepened by what is handed down from the generations who have gone before you. This isn’t book-learning (though your notes will help with some things, and perhaps your schooling will be a means of keeping body and soul together in times of financial hardship). Sometimes you will seem to be doing nothing. But actually, those will sometimes be when you are doing the most significant work of all. It is hard. Forget the romantic notions. Yes, there will be moments of beauty: moments when you can watch a lamb gamboling across a field; time to enjoy a deep blue sky, the sun hot on your back, lying beside a stream and breathing in the sweet scent of grass… But these moments will be interspersed with others when it is grey; raining; when you look death full in the face and have hands covered in excrement. You will see all of life. You need others. There will be people to whom you are asked to pass on your wisdom. And sometimes, if you are fortunate, others with whom to share the everyday tasks. You will need people from outside, too – a vet, other shepherds – who understand the burden you carry; who speak your language and share your joys and sorrows, notionally, if not specifically. They will help teach you how to shape your flock. They will have expertise and wisdom to share. You in turn may be able to help them. Perhaps they’ll share other resources too, to help you develop characteristics your flock needs but which, as things stand, it lacks. The buck stops with you. It is work in which you bear the burden of responsibility for your flock. Of course, you’re only human, you will probably forget that, at least sometimes. Which won’t end well. You will worry about your flock as you worry about children. Much of what you do will go unnoticed; you may seem invisible, irrelevant. Yet this is not a reflection of reality. You will love your sheep. Not in a superficial, saccharine way, but deeply, and despite that it is costly and that they can be wilful, independent, difficult to manage. They will infuriate you; sometimes you will despair of them; yet you will graft and toil in their service. In the middle of winter you’ll brave the ice and the rain and wind to care for them. You’ll know them each individually: their heritage, their character; their good points and their flaws. Sometimes you will do things they don’t want you to do, that they don’t yet recognise but will get used to and which will come to be normal and will enrich their lives. You will fetch them when they are lost; feed them when they are hungry; tend to them when they are ailing; protect them when they are in danger. Because in the end, you have been given them to care for. And you will, for that is what is asked of you. In the end, all of this is worth it. It is worth it without a shadow of a doubt, or even the need of a moment in which to weigh up the balance. Why? It is simple: this is what you were made for. These sheep; this flock; this place. You were created for this, so you are obedient to it, and in your obedience, you discover there is joy in this work. Just as you shepherd, so are you shepherded. And this is the green pasture, and these the still waters, to which He has led you. You belong here.